(Photo taken by Josh Franken). Pittsburgh native Jim Allan is not about to miss the Super Bowl, even if it means flying halfway around the world to catch the game live. “I live in Indonesia, but Pittsburgh is where my heart is,” said Allan. Allan, born and raised in Hampton, has spent the last 14 months living in Asia, first in Korea and now in Indonesia. Working abroad as a manager for a public relations agency, he has been able to keep a close eye on the Steelers despite living in Jakarta, Indonesia – approximately 10,028 miles away from Pittsburgh. Allan is not about to let the time difference and the cultural barriers of living abroad keep him from watching the Steelers. During his time in Asia, Allan would regularly wake up in the middle of the night to watch the Steelers live via a satellite feed. Allan has also spent a great deal of time educating his Indonesian friends and coworkers on the Steelers and the NFL, both new concepts in a developing nation with a Muslim-majority population. taken it throughout Indonesia during his time there. 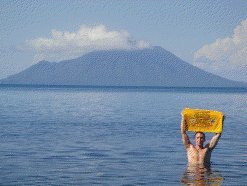 From the beaches of Bali, to the summit of Mount Merapi (the largest active volcano in the country), he has always spread his love of the Steelers with the locals. Allan was preparing to watch the AFC Championship Game on January 23, when he received a surprising phone call from back home only a few hours before kickoff. After hearing the news that his family had won Super Bowl tickets, Allan wasn’t about to let the international flight – crossing 13 time zones – keep him from “knocking on seven’s door” with the rest of the Steeler Nation this upcoming Sunday. “I never let the fact that I am halfway around the world get in my way of watching the Steelers,” said Allan. “I’ve woken up in the middle of the night for kickoffs, gone to U.S. Army bases to catch live broadcasts, blasted “Renegade” over mosque prayer calls at 4:30 a.m. – I’ve never felt too far away,” said Allan. After the Steelers defeated the New York Jets in the AFC Championship game, Allan immediately booked tickets to meet his family and friends in Dallas. Allan will fly cross three continents for a total of 32 hours to make it to Dallas for the big game. However, he is not letting the risk of jetlag – or the fact that he hasn’t seen his team live since 2009 – interrupt his plan to be in attendance.